Throughout the year we’ve been celebrating the unique clothing of the various people living and visiting Pennsbury Manor in the late 17th Century. After featuring the Laborers and the Servants/Tradespeople, we can highlight the Community Leaders! This painting by Matthijs Naiveu, "The Cloth Shop," 1709 depicts two different couples. The couple in the foreground is from a wealthy and aristocratic background. The business owners in the background have a more limited but substantial position in the community. Their clothing modeled the rich textiles they might sell. This class of people would not have been as high as Governor William Penn and his wife Hannah, but they would have been acquaintances and even friends. While many people immigrating to the colony came with very little money, posessions, or even skills, there were some that came ready and able to establish themselves in the New World. They had enough with them to build up a home, start a business, finance merchant vessels, and encourage the trade network that helped build up a strong economy, which was vital to a colony’s survival. The clothing of these leaders would need to reflect their prosperous positions. While they certainly had work to do, their station allowed them more free time to devote to public duties. These men and women would have been leaders in their communities. Men would have performed civic duties, perhaps serving as a government official, while the women (particularly Quakers) would also have community activities requiring time and money. Pennsbury Manor volunteers Steve Ringel and Melissa Dill are shown here modeling appropriate clothing for colonial “community leaders” from the late 17th Century. Melissa is wearing a fashionable “Mantua” gown (featured in a previous post) in a fine striped wool. The floor-length petticoat indicates she wasn’t planning on traipsing through the muddy streets or across a field. Her crisp white linen apron was serviceable, but clearly shows the lack of hard labor in her daily life. Steve’s stream-lined “Justacorps” coat (also featured previously) may not have the full-skirted effect of the fancier frock coat, but it’s made of a fine quality wool with modest cuffs and a warm wool waistcoat beneath finished with fine horn buttons. His full cravat is in keeping with the latest fashion, and clean white stockings obviously showing the lack of dirt involved in his daily life. The effect of his ensemble is simple yet refined,which would have been in accordance with his Quaker beliefs while still announcing his position of stature. The joyners open their shop on special events at Pennsbury Manor so students can learn about their trade! 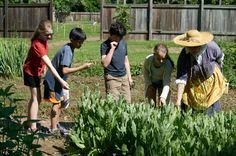 Students smell fragrant herbs in the kitchen garden at Pennsbury Manor. Pennsbury Manor is Open for tours. Admission charged. Tour times are 12:30pm, 1:30pm, 2:30pm, and last tour 3:30pm. Meet our gardeners and lean what’s happening this spring in the Kitchen Garden. Stop in the Brewery and watch the brewers in action. Pennsbury Manor is Open for regular tours. Admission charged. Tour times are 11:30am, 1:30pm, last tour 3:00pm. 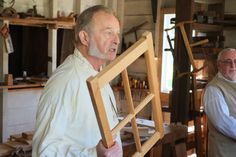 Pennsbury Manor is administered by the Pennsylvania Historical and Museum Commission with the assistance of the Pennsbury Society, a non-profit 501(c)3 support organization. Tom Wolf, Governor. Nancy Moses, Commissioner. Andrea Lowery, Executive Director.